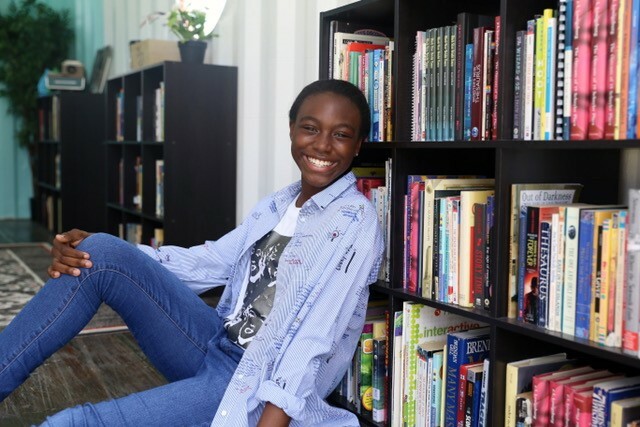 WEST PALM BEACH, Fla. (November 21, 2018) — Taylor Moxey, a 12-year old philanthropist and entrepreneur from Miami, will celebrate the grand opening of her third mini-library on Tuesday, November 27 from 6:00 to 7:30 p.m. at the new outdoor activity space called “Dance into the Sunset,” located at 600 4th Street in West Palm Beach. The new public library is housed in a converted and refurbished shipping container and includes a range of reading materials for all ages to enjoy seven days a week, from dawn to dusk. The pop-up library is a partnership between the Taylor Moxey Foundation, the City of West Palm Beach, West Palm Beach Arts & Entertainment District and the West Palm Beach Community Redevelopment Agency. The grand opening of the library also marks the official opening of the new outdoor activity space, which aims to connect the Historic Northwest with Downtown West Palm Beach by creating a vibrant, walkable path between Downtown and the Sunset Lounge. The Dance into the Sunset project is being executed by the City’s Office of Public Life, the first of its kind in the nation, which takes into account how people use City of West Palm Beach public spaces. The A&E District issued a call to artists to create a mural on the exterior of the pop-up library. Concepts for the unique mural for the shipping container were required to be uplifting, create a sense of place and celebrate the community’s rich history of music and dance. The winner will be announced at the grand opening next week. The Taylor Moxey Foundation is conceivably Moxey’s most impressive venture. She started it solely to empower, educate and endow young girls and boys with the tools necessary for them to become civic-minded entrepreneurs and leaders. At a very young age, she grasped the concept that philanthropy is simply not about monetary donations and charity, but it is about solving a problem and empowering the less fortunate to bring about real change. Moxey’s foundation most recently partnered with TECHO to work to build small homes for the underprivileged in Latin America and Haiti. Launched four years ago, the A&E District encompasses more than 20 distinct and distinguished cultural venues. In addition to helping to bring the Taylor Moxey Library to West Palm Beach, the A&E District has been involved with the Musical Swings; Harmony: An Exhibition of the Arts; CANVAS Outdoor Museum Show, CONTINUUM WPB Arts; Inside Out/Dreamers Project; Short Story Dispensers; Truth Booth; and other pop-up performances and projects. The West Palm Beach A&E District is a centralized collection of inspiring arts and entertainment venues; art and history museums; galleries; libraries; performing arts companies; and art education institutions. Situated in the heart of South Florida’s most progressive city, the District includes more than 20 distinct and distinguished cultural destinations that form a defining industry cluster. The A&E District enhances the appeal of West Palm Beach as a visitor destination, drawing attention to its status as a vibrant city illuminated by its beauty and range of creative expression. A free trolley dedicated to connecting partners makes getting around the District easy and enjoyable.